Below are picks chosen by PRX editorial staff. 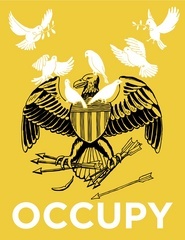 You can see all potential pieces for Occupy Wall Street by using our search. Jackson Browne, David Crosby and Ani DiFranco and others discuss how Occupy and other movements inspire their socially conscious music. Hosted by Lisa Simeone. Also features interviews with Dar Williams, Joel Rafael, James McMurtry, Jason Samel and Matt Pless, plus the songs they contributed to the "Occupy this Album" compilation released to raise awareness for Occupy and its core issues. Touching on ethics, justice, democracy, and global citizenship, Rabble Rousers explores the notion of protest as a spontaneous installation of improvised 'music' in public space. "Protest, evasion, merry distrust, and a delight in mockery are symptoms of health; everything unconditional belongs in pathology." A crowd of dissenters claps, chants, cheers, and shouts into the open air. Their chance choral creations are at once jubilant and angry, orderly and chaotic, rhythmic and random, melodious and cacophonous. Touching on ethics, justice, democracy, and global citizenship, Rabble Rousers explores the notion of protest as a spontaneous installation of improvised 'music' in public space. Rabble Rousers features field recordings of protests from around the globe – including many culled from the Occupy Movement – as well as Creative Commons contributions from Random Coil, Pleq, Papercutz, Carlos Lemosh, Marcus Fischer, Upsteria, Erstlaub, Aurastore, Aos Crowley (Matt Dean), Pocka (Brad Mitchell), Matthias Kispert, and the Prelinger Archives. Recipient of a Silver Medal for Best Sound at the 2013 New York Festivals Radio Programming Awards. The original version of Rabble Rousers, featured on the first tab above, contains strong language at 1:38, 1:43, 6:03, 10:38 (muffled), and 16:17 (muffled). A profanity-free version of Rabble Rousers is available on the second tab above. A debate from Oakland, California between practitioners of non-violence, versus those who believe a diversity of tactics is what Occupy needs to move forward. The Occupy movement has changed the way Americans view political activism. And there's a raging debate over what tactics should be used. How is social change achieved, and does violence have a role to play? On this edition, a debate from Oakland, California between practitioners of non-violence, versus those who believe a diversity of tactics is what Occupy needs to move forward. Begin Date 01/18/12. End date 07/18/12. The Tulsa Police Department has been using pepper spray since the nineties, but the device made headlines earlier this month after TPD sprayed five Occupy Tulsa protestors in the face. Last week, the protesters announced their plan to take the city of Tulsa to court, claiming the cops used excessive force. The use of pepper spray against peaceful protestors began receiving national attention this week when a video of a cop spraying protestors at University of California, Davis went viral. In this segment, the Occupy Tulsa protestors tell the story of what happened the night they got sprayed, and TPD delivers their side of the story. The Tulsa Police Department has been using pepper spray since the nineties, but the device made headlines earlier this month after TPD sprayed five Occupy Tulsa protestors in the face. Last week, the protesters announced their plan to take the city of Tulsa to court, claiming the cops used excessive force. The use of pepper spray against peaceful protestors began receiving national attention this week when a video of a cop spraying protestors at University of California, Davis went viral. In this segment, the Occupy Tulsa protestors tell the story of what happened the night they got sprayed, and TPD delivers their side of the story. We talk to Deborah Blum of Scientific American about what to do if you get pepper sprayed. We tell you what to do if you get pepper sprayed. ‘We are the 99 percent’ has become a rallying cry for people uniting to change a system based on greed and exploitation. We’ll look at what it’ll take to transform this ‘movement moment’ into long term solidarity for systemic change. ‘We are the 99 percent’ has become a rallying cry for people occupying their cities and towns across the United States; people uniting to change a system based on greed and exploitation. Many are now asking how to move towards a common vision that addresses the needs of everyone within the 99%--especially of those who are who are hit hardest by the current economic system. On this edition, we’ll look at what it’ll take to transform this ‘movement moment’ into long term solidarity for systemic change. Robert Reich, University of California at Berkeley professor of public policy; Maria Poblet, Just Cause/Justa Causa executive director; Steve Williams, POWER co-executive director/co-founder; Needa B, Occupy Oakland participant; Lisa Gray-Garcia, Poor Magazine co-editor and author of Criminal of Poverty: Growing up Homeless in America. Begin Date 11/30/11. End date 05/30/12. Thousands gathered in downtown Oakland to occupy the ports and shut them down. Exploring a night with the Occupy Oakland movement, partly a party, partly a protest, the events of the evening take a turn and the atmosphere changes. This piece allows the listener to travel through the protest exploring questions of solidarity, focus, and the mission of Oakland's Occupy movement. A round-the-world tour of protests in Canada, England, France, Spain, Ukraine, the United States, and beyond. A round-the-world tour of protests in Canada, England, France, Spain, Ukraine, the United States, and beyond. This radiophonic work was inspired by contemporary composer Luigi Nono's use of fragmented and layered political texts, as well as his method of treating 'real world' artifacts as potential music. With 24-year-old USM student Jacob Lowry as our guide, we learn about Occupy Maine's encampment in Lincoln Park and accompanying infrastructure. Like many of the solidarity demonstrations across the nation and globe, Occupy Maine governs by consensus, meaning that everyone has to agree on every decision. Obviously, this is a slow process.